Nestled on the beach, this Isla Bastimentos resort is in a national park and 0.3 mi (0.5 km) from Red Frog Beach. Situated by the sea, this lodge is in the same region as Bastimentos National Marine Park and Playa Larga. 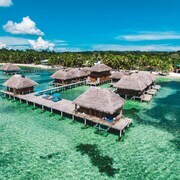 Where to find Isla Popa hotels near an airport? Where can I find hotels in Isla Popa that are near tourist attractions? For tourists planning a trip to Panama and want to book an Expedia-listed room in Isla Popa, there are a number of options. Isla Popa has 3 quality Expedia-listed accommodations within 0.1 kilometres (0.06 miles) of the center of town. 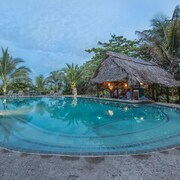 The Laguna Azul Eco Lodge is one of the most conveniently situated hotels because it is one of only a few options within walking distance of the Isla Popa downtown area. The Laguna Azul Eco Lodge can be found 3 kilometres (2 miles) from the middle of Isla Popa. 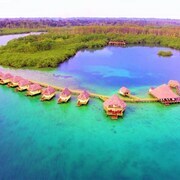 Alternatively, the Red Frog Beach Island Resort is located 18 kilometres (11 miles) away. The Tropical Suites Hotel and the Playa Tortuga Hotel Beach And Resort are two other hotel options in Isla Popa. Looking for more things to do? 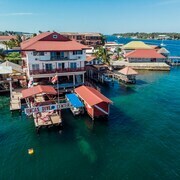 Consider spending some time exploring La Buga Dive Center & Surf School and Lil' Spa Shop by the Sea, in Bocas Town, 20 kilometres (14 miles) to the northwest of Isla Popa. 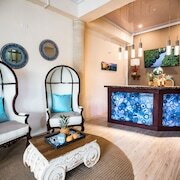 Bocas Town accommodation options include the Swan's Cay and Hotel Tierra Verde. Or, you could consider staying in Boquete, 60 kilometres (36 miles) to the southwest of Isla Popa, where you can pick from the HOTEL PANAMONTE and Valle Escondido Resort Golf and Spa. If you're staying in Boquete, a couple of places to add to your itinerary are the Municipal Park and Church of San Juan Bautista. Tobias Bolanos International Airport is a logical airport for flying into and leaving Isla Popa. It is 240 kilometres (147 miles) away. If you choose to stay nearby, try the Real InterContinental Costa Rica at Multiplaza Mall or Costa Rica Marriott Hotel San Jose. What are the most popular Isla Popa hotels? Are there hotels in other cities near Isla Popa? 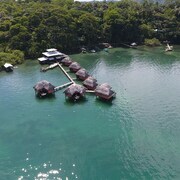 What other types of accommodations are available in Isla Popa? Explore Isla Popa with Expedia.ca’s Travel Guides to find the best flights, cars, holiday packages and more!